Europe offers many cultural opportunities, world class art galleries, ancient buildings and historic settings but occasionally you just need the sights, sounds and smells of motor sports. I satisfied that need during our Grand European Adventure with a tour of the Ducati Factory and Museum in Bologna, Italy. Our tour started in the cafeteria where you can grab an espresso with the workers before your guide gathers you for a briefing. As you are entering a working factory, there is the necessary formality of a signing a waiver but I saw no danger unless you took a photo (more on that soon). The groups are small at no more than ten people except Saturday when they take larger groups of up to 40 and the information provided in English. Ducati motorcycles are built on a moving assembly line with only two pair of hands responsible for each bike, and you are guided through the whole process. Photography is strictly forbidden in the factory, a German tourist in our group got caught by our steely-eyed guide and received the most fierce tongue-lashing from her. He only managed to stay on the tour by the his fingernails, it is not worth the grief for a cheap illicit photograph. We were lucky enough to be there the day after the Limited Edition Paul Smart 1000 motorcycles started production, and the first examples sat proudly in the shipping room. As you exit the production floor, you are permitted to gaze through a window at a corridor filled with factory racing engines and closed door that hides the secrets of Ducati racing success. I could feel the spirit of Fabio Taglioni with me. 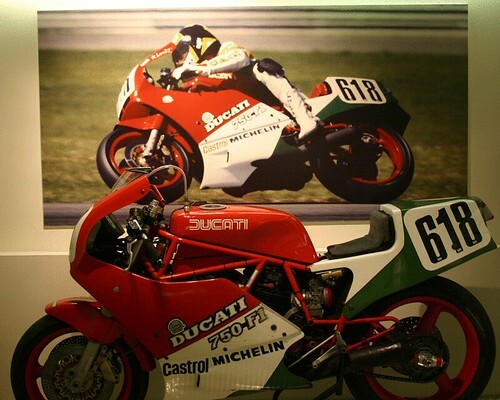 The factory tour is interesting but the museum is fantastic, focussed on Ducati’s racing pedigree with examples of every major Ducati race bike. Mike Hailwood’s Ilse of Mann NCR and Paul Smart’s Imola 750 classic have pride of place, probably the two most iconic motorcycles ever built. Then there are the superbikes, every World Champion is represented here; Troy Corser, Troy Bayliss, Raymond Roche and Doug Polen to name a few of the famous riders for Ducati and soon the bike of MotoGP World Champion Casey Stoner will join them there. You can spend hours here, photography is permitted and the bikes are beautifully maintained. Your guide provides an introduction to the history but then you are on your own and free to wander in wonder amongst the machinery. The gift shop sells everything a Ducati aficionado needs except a motorcycle and I’m sure if you ask something could be arranged. You must book ahead, and I recommend at least four weeks ahead of your intended visit date. Closed also during Easter vacations, summer break (July 29th to August 26th), October 4th, November 1st-3rd, Christmas vacations (from December 23rd to January 7th), and on all Italian public or bank holidays. Taking photographs is allowed in the museum but not inside the factory. Best of all, entrance is free. How can you say no to that.